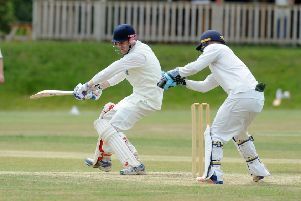 Wath & Melmerby recorded a first win since the opening day of the 2018 campaign to climb out of the Theakston Nidderdale Division One relegation zone. After seven defeats in as many completed fixtures, Bobby Hilton’s men got back on track when they heaped more misery on rock-bottom Bishop Thornton, the same side they overcame in week one. Wath batted first, and although none of their players managed to score more than skipper Hilton’s 36, a total of 40 extras helped them to 182 all out. The Curlews, who also went into the fixture with only a solitary success to their name, were never in the hunt when they responded. Rob Nelson hit 26, but that was as good as it got for Thornton as 4-32 by Mitchell Cross and 3-17 from Hilton saw the hosts dismissed 100 runs short on just 82. Taking Wath’s place in the bottom two are Knaresborough Forest following their seventh loss of the campaign, a three-wicket reverse at the hands of mid-table Masham. Harvey Green’s knock of 37 was the best the strugglers had to offer in their 135 all out, Ben Fielding snapping up 4-27. Australian opener Brodie Eccles (47) led the Masham reply, and although wickets fell at regular intervals, the away team made it over the line seven down and with plenty of overs to spare. Bob Addison (3-23) was the pick of the Forest attack, but his efforts proved to be in vain. At the opposite end of the table, there are new leaders of the pack. Birstwith’s firepower saw them rack up a big total against Goldsborough and then go on to record a seventh consecutive triumph. George Hirst (56), Jon Millward (55 not out) and Craig Robinson (51) all hit half-centuries, while Craig Armitage (47) and James Riley (39) also impressed with the bat in a sizeable total of 301/7. The visitors were unable to keep up with the required run-rate when they took to the crease, but Aussie Jarrod McPhee (50) and Luke Boniface (39) did their best to help their side stay in the game. They finished up well short on 206/8 in the end, however, Robinson and Nick Wain each taking three wickets for Birstwith. Helperby remain second, 10 points off the pace, after bouncing back from their first loss of the season last time out. Dan Marston’s charges tackled Burton Leonard - the team who began the weekend top of the pile - and emerged victorious by a six-wicket margin. A knock of 63 by all-rounder Sam Crompton was the foundation on which Burton’s 154 was built on, Brandon Bant grabbing 3-30 and Al Darnell 3-42. Helperby slipped to 43/4 in reply, but an excellent 114-run stand between Joss Spilman (67 not out) and Bant (48 not out) secured maximum points and ended the hosts’ long unbeaten run. 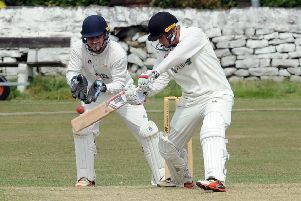 Darley chalked up a third win on the bounce when they bowled out West Tanfield for 177 on home soil. Duncan Naylor’s troops made their way to 192, Jordan King leading the way with an innings of 80 at the top of the order. Angus Shaw (4-40) and Jonny Luty (4-46) shone with the ball for Tanfield and the visitors made a decent fist of their chase. With openers Brendan Millar (59) and Josh Barrett (45) both in good touch, they looked well set at 121/2, however King (4-6) sparked an middle and lower order collapse and the Ripon outfit were dismissed 15 runs short. Dacre Banks completed a league double over defending champions Ouseburn courtesy of a comfortable 67-run success. The men from the Max Pullan Recreation Ground pulled off a shock result on the opening weekend of 2018, their first top-flight outing since promotion from Division Two. And they repeated the trick thanks to some superb bowling by Muhammed Khuzafia (5-37) and Salman Sayed (4-20) as Ouseburn were sent on their way for 136. Earlier, Stephen Ellison had struck 63 of Dacre’s 203/9, Chris Morrison claiming a trio of scalps in what proved to be a losing cause.